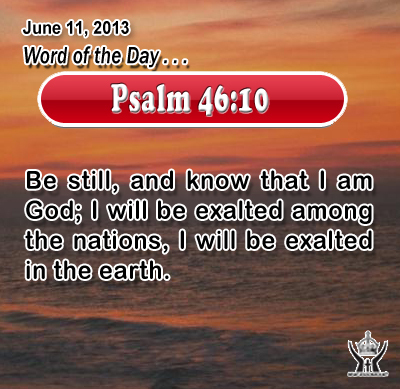 Psalm 46:10Be still, and know that I am God; I will be exalted among the nations, I will be exalted in the earth. O Father in heaven, may your name be respected and held holy in our life and our world today. Your will be done, your reign on earth come with power and might and inevitability, just as it has already come in heaven. Through Infant Jesus we pray. Amen. 13"You are the salt of the earth; but if salt has lost its taste, how shall its saltness be restored? It is no longer good for anything except to be thrown out and trodden under foot by men. 14 "You are the light of the world. A city set on a hill cannot be hid. 15 Nor do men light a lamp and put it under a bushel, but on a stand, and it gives light to all in the house. 16 Let your light so shine before men, that they may see your good works and give glory to your Father who is in heaven. Jesus used the image of light and a lamp to added his illustration. Lamps in the ancient world served a vital purpose, much like they do today. They facilitate people to see and work in the dark and to avoid stumbling. The Jews also understood “light” as an expression of the inner beauty, truth, and goodness of God. In his light we see light. His word is a lamp that guides our steps. God’s grace not only lights up the darkness in our lives, but it also fills us with spiritual light, joy, and peace. Jesus used the image of a lamp to explain how his disciples are to live in the light of his truth and love. Just as usual light illumines the darkness and enables one to see visually, so the light of Christ shines in the hearts of believers and facilitates us to see the heavenly certainty of God’s kingdom. In fact, our mission is to be light-bearers of Christ so that others may see the truth of the gospel and be flowing from the blindness of sin and deception. Loving Infant Jesus, you guide us by the light of your saving truth. Fill our heart and mind with your light and truth and free us from the blindness of sin and deception that we may see your ways clearly and understand your will for our life.